Debbie Long is a visual artist whose works engage the physical phenomena of light, color, and space and how these phenomena communicate outside the language of words. She refers to her process as a ‘corralling of happy accidents’, which seems to capture the sense of wonder in her work. One of Debbie’s recent artworks, Naima, 2013, is a chamber of purple light and glass hidden inside an unassuming rusty trailer. 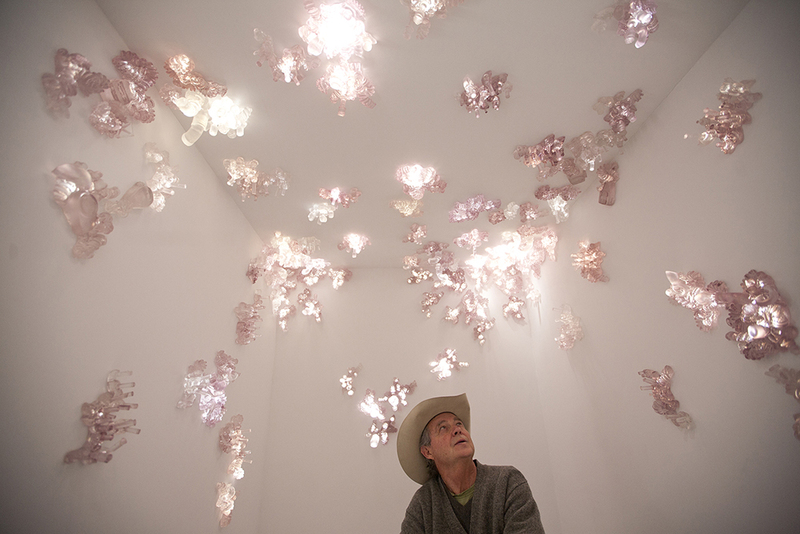 Hundreds of hand-made cast glass objects collect light from the sky. The interior changes as light shifts throughout the day from sunrise to sunset. Each piece of glass is cast and the mold is destroyed in the firing process, making each element a unique sculptural element connected to the cycles of light and built to be experienced over time. Naima is a chamber of purple light and glass hidden inside a rusted trailer. Hundreds of handmade cast glass objects collect light from the sky. The interior transforms as light shifts throughout the day, sunrise to sunset. Described by the artist as a jeweled chamber of purple light and glass hidden inside an abandoned-looking 1970s travel trailer. This is where we drank tea and talked with Debbie. Whether she is casting found objects of the desert into glass or converting an old trailer into a light sanctuary, Debbie employs an element of experimentation into her process. For the In the Night Kitchen videos shown below, Debbie investigates the use of video choreography with cast glass sculptures, sound, light and movement. In the Night Kitchen. 2015. 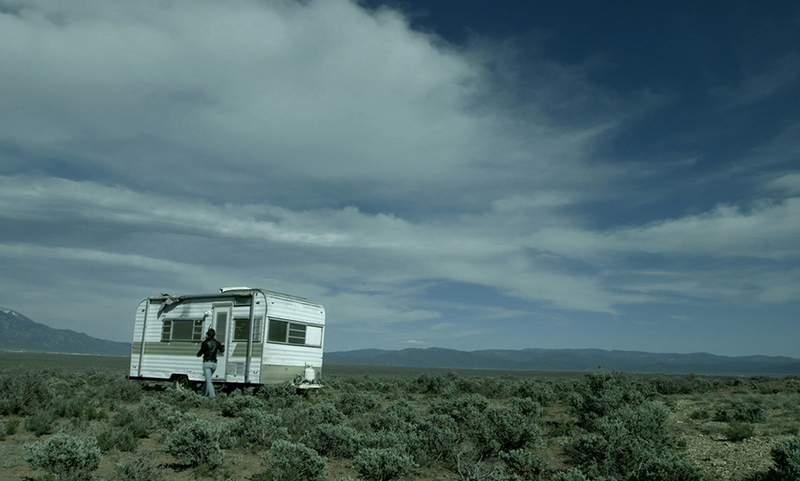 Video, Light, Glass, Night Desert sounds recorded behind the Taos studio October 2015. In the Purple Night Kitchen. 2015. Video, Light, Glass. 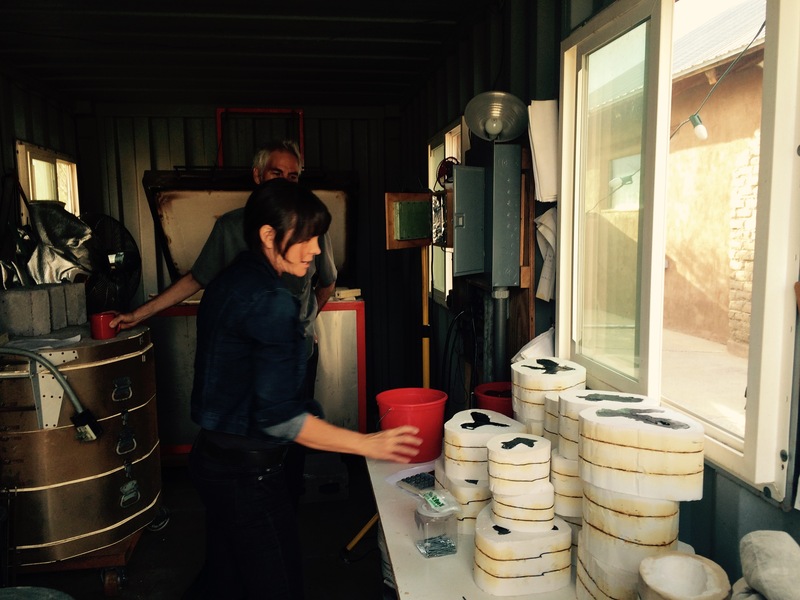 Debbie has a shipping container behind her studio where she uses the kiln for the glass casting. In this photo are the molds hinting at the laborious process for each cast glass element. For our interview with Debbie I made a Raw Cashew Dream Cake. Here’s a link to the recipe, as I changed almost nothing! 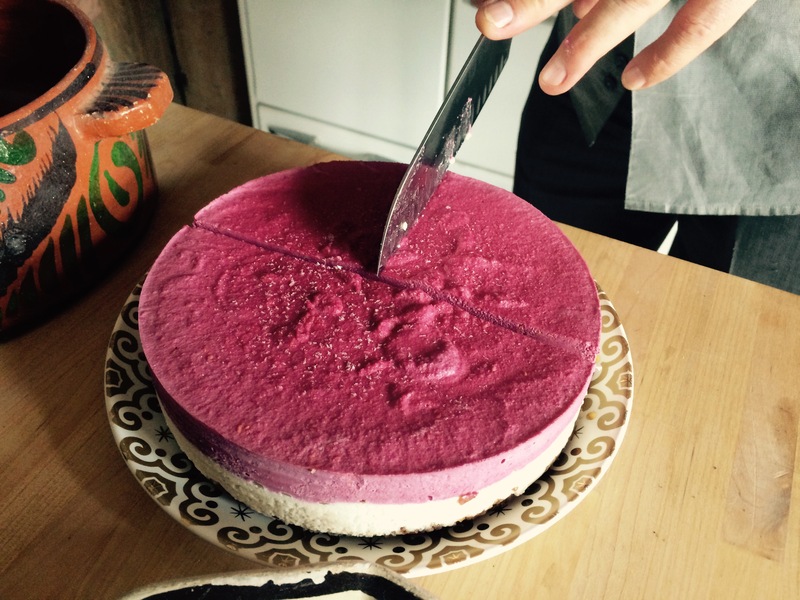 Raw Cashew Dream Cake served at Debbie’s studio. For the crust I cut the dates in half & replaced the missing dates with candied-ginger. A must for my future versions, & yours too, providing you don’t hate candied-ginger. (a friend of mine was once gifted some candied-ginger by a person now un-affectionately known as ‘the ex-husband’ & will, kindly, be leaving the candied-ginger out, forever! thank-you-very-much! HA! People take divorce far more seriously than marriage, don’t you think? I also played it fast & loose with the measurements: I had some extra cashews & just dumped them in, “what else was I going to do with soaked-cashews”? I didn’t feel like messing up a measuring cup with honey–it is just so sticky & hard to get out of the measuring cup & another thing to clean, oh bother! So I just poured what looked like 1/3 cup into the pan. I didn’t have a vanilla bean & didn’t want to go back to the store so I left that out. The organic ones are super expensive, too! I have made this recipe with raspberries (as called for), apricots, & tart cherries: all of them were delicious! The cake is really pretty & you can bring it to one of those occasions where you just don’t remember: IS the host gluten-free? lactose-intolerant? hypo-glycemic? “not eating sugar right now,” or just plain, hard-to-please? AND, best of all you don’t have to make any excuses if they are none-of-the-above!